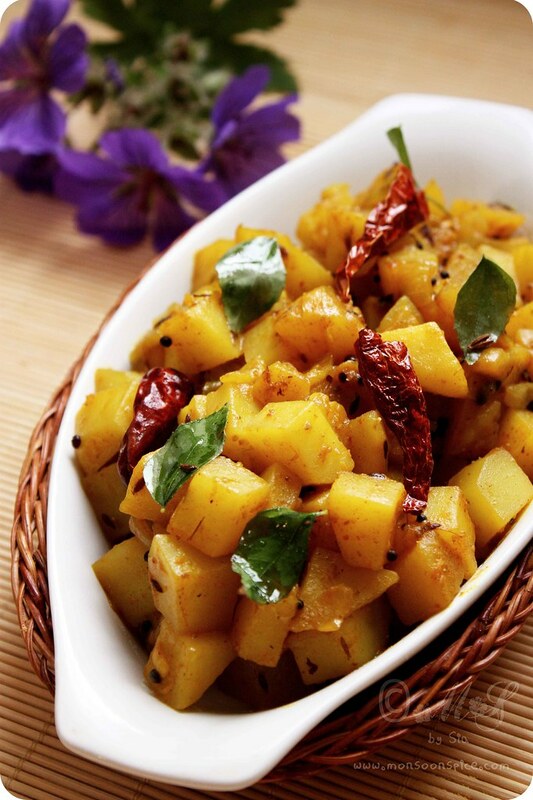 Monsoon Spice | Unveil the Magic of Spices...: Aloo Fry: An ode to the versatile spud! Wonder what I am rambling about? 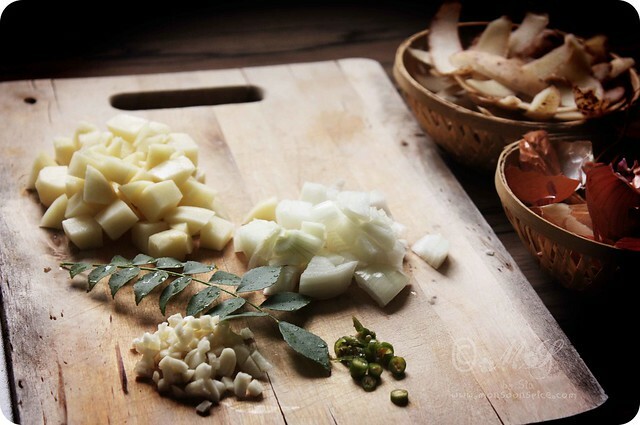 It's just our humble potato or aloo/alu, batata… The above mentioned are some avatars of potato that come out from my kitchen at least once or twice a week. In my family we may like some vegetables or simply hate other vegetables, but one vegetable that we all are very fond of is this humble spud. Cook it any way and present it in any form, you can be 100% sure that it will be relished with complete devotion and enthusiasm by all three of us. We are the family who will happy sing our ode to the potato. And why not? You can cook this tuber with any other vegetable, and use any spices or herbs you like; it will simply embrace them and create a wonderful marriage between flavour and your palate. After all we all love happy endings, don’t we? And it is difficult to find, if not impossible, any other vegetable that can compete with this spud when it comes to popularity and versatility. Heat oil in a kadai/wok and add mustard seeds, cumin seeds, dry red chillies, curry leaves and hing. When mustard seeds start to pop and splutter, add finely chopped onions and fry for 2-3 minutes on medium flame. Next, add ginger-garlic paste and fry for 2 minutes till the raw smell disappears and onions turn light brown in colour. Mix in diced potatoes and give it a good stir for a minute or two. Add all the spices listed above one by one along with salt to taste and mix them well to coat every potato piece. If using lime/lemon juices save it till the end. Sprinkle little water and cover the wok and cook for 5-8 minutes. Give it a good stir in between to save the potatoes from sticking to the bottom of the vessel. Sprinkle little more water if needed and cook for another 3-5 minutes till the potatoes are cooked thoroughly. Add lime/lemon juice if using and switch off the gas. Mix in finely chopped coriander if desired and serve this delicious Aloo Fry hot with any Dal/Lentil dish, Ghee and Rice or any Indian flat breads and enjoy. If you are short of time, simply use boiled, peeled and cubed potatoes and it will take half the cooking time. 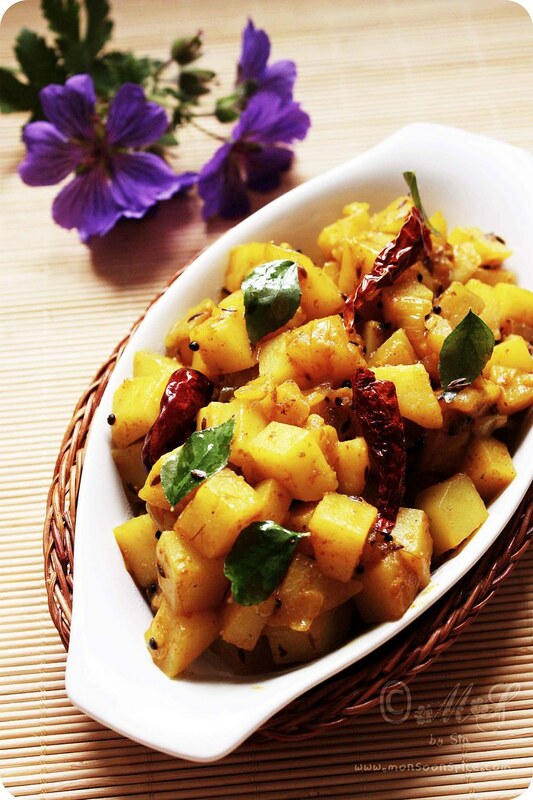 You can leave out onions and ginger garlic paste and just use potatoes to make simpler version of Alu Fry. Same pinch :) I love potato as much as your family does. Love this preparation of yours and I love the clicks a lot as well :) Superb. 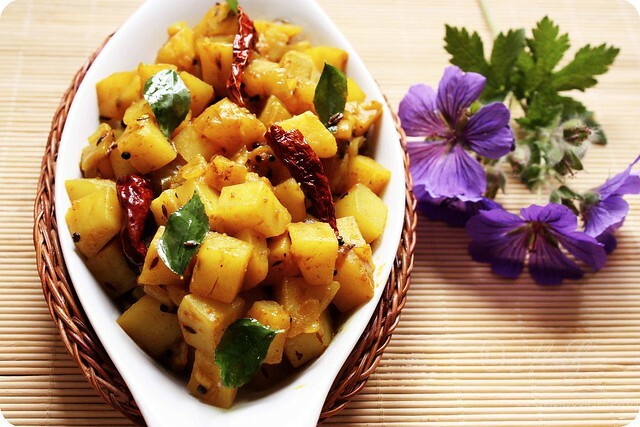 yummmmmmmmmmmmmmmmmmy delicious and droolworthy aloo fry. 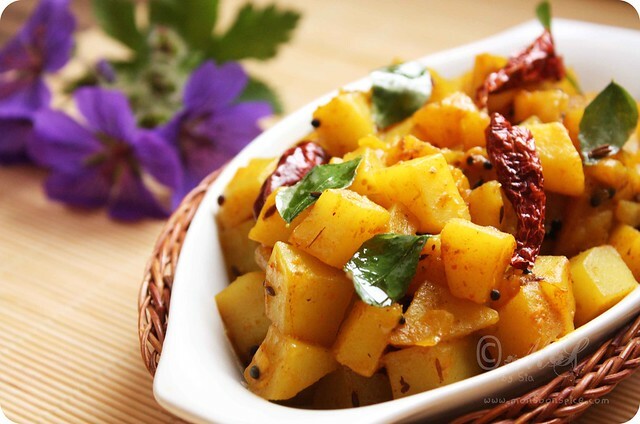 All time favorite aloo fry looks awesome! I was never a fan of potatoes - but I do enjoy them more now that we get so many different varieties here. slurp ,fried aloo looks so yum,. wow, lovley clicks, this is an all time favourite in my house too..